Atlanta, July 14, 2012- Three times during their collegiate careers, Wil Spencer of the University of Georgia got the better of rival Kevin King from Georgia Tech. Competing now as professionals on the ATP stage, King finally was able to reverse the outcome, earning a 6-4, 6-3 victory Saturday over Spencer in the first round of qualifying at the BB&T Atlanta Open being played at Atlantic Station. "Today I was able to win the closer games," King said. "It did feel a little different out there. I mean, you’re not playing for a college team. You’re out there on your own court and everyone just watching your match." King, whose father Bill played football at Villanova, hails from Peachtree City and recently concluded his collegiate career as Georgia Tech’s all-time wins leader in doubles. King finished with 90 doubles victories, surpassing the previous Tech career record of 82 by Sergio Aguirre (1997-01). Spencer began his collegiate career at Texas A&M and transferred to Georgia after his second year. He led the Bulldogs to the semifinals of the 2011 NCAA Championships and the Championships of the 2012 SEC Tournament. "It was just the luck of the draw," Spencer said. "It’s always going to be a little more competitive because of the rivalry." King, 22, snapped a string near the end of the first set, but said that not only didn’t deter him but actually made him play better. "I got that set and then relaxed and was able to play better in the second," he said. 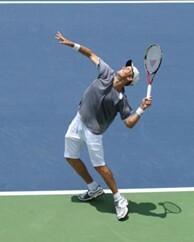 Last year at this event, King made headlines taking advantage of a main draw wild card in doubles and teaming with former Georgia Bulldog Drake Bernstein to knock off the top-seeded team of Scott Lipsky and Rajeev Ram. Like King, Bernstein once again capitalized on his wild card entry on Saturday to defeat Bradley Cox of Duluth, Ga., 6-3, and up 5-0 before Cox retired from the match. Another Georgia Bulldog, Nathan Pasha, took the first set off of No. 5-seeded Rik De Voest of South Africa before falling, 6-7 (5), 6-2, 7-5. And the fourth and final Bulldog in the draw, Ignacio Tamboda, lost his match to No. 2-seeded Ricardo Berankis of Lithuania, 6-2, 6-1. Judd Motz, a nationally ranked high school junior from nearby Norcross, got a taste of the big-time as he drew No. 6-seeded veteran Tim Smyczek and lost, 6-0, 6-1. Smyczek called Motz a good player, but didn’t want to spend any extra time on court because of the hot temperatures. "In this heat the less time you stay on the court the better," Smyczek said. "I love the venue here. It’s a great atmosphere." (2) Ricardas Berankis, Lithuania, vs. (wc) Drake Bernstein, U.S.
Luca Margaroli, Switzerland, vs. (7) Alex Kuznetsov, U.S.
Grandstand Court, Starting at 11 a.m.
Olivier Sajous, Haiti, vs. (6) Tim Smyczek, U.S.
Court 3, Starting at 11 a.m.